My friend Greg Ruth asked me about my thoughts on doing public painting demos, so here are a few musings. Drawing or painting in front of an audience has its challenges. It's really a kind of performance. 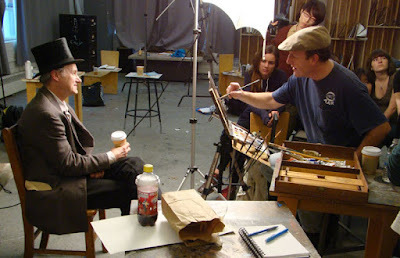 I've done everything from Vaudeville style chalk talk gags for bored first graders to oil portrait demos at art schools. For both, I lower my expectations about how well the painting is likely to turn out. That's because I have to fire up both brain hemispheres so I can talk and draw at the same time, something I'm not as accustomed to doing as art professors are. Also I can't predict the outcome because I don't have a single tried-and-true system of painting. I may come at the subject with pencil, watercolor, casein, gouache, or oil, depending on how adventurous I'm feeling, or what I happen to have with me. While I'm up there, I alternate between moments of confidence and moments of doubt. I think it's best to avoid expressing too much of either emotion. What the audience genuinely does need is a practical understanding of how that internal struggle plays out on the page. How do you spot an error, and how do you fix it? What makes you decide to rub something out? What things to you need to get right at different stages? The demo should be not merely a display of the outward process, but also of the reasoning behind the process, so that the student has a map to find their way through the thicket. 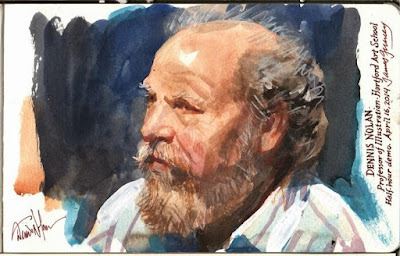 Greg Ruth interviewed a lot of other artists on this topic, and you can read the range of thoughts on demoing on the blog Muddy Colors. I'd be interested in any comments from those of you who are veterans at doing painting demos. And I'd also like to hear from students about what you like most about the best demos you seen (It's OK to name names or suggest videos). Also, what are your pet peeves about demos that haven't been helpful (without naming names). I regularly demonstrate to art clubs and societies here in the UK. I specialise in watercolour, which allows me to do a fairly large painting (15x22") in the space of about two hours, with an all-important break for tea and biscuits. The title or theme is usually the choice of the club as they will have a range of artists throughout the year, and they appreciate variety. I've been doing this for around 14 years so I've come to know what the audience wants, or expects, to see. But it never pays to be complacent. I find they really appreciate me starting with a blank sheet, as the drawing is equally important as the painting. I have often heard that artists will appear for demo's with the drawing already done. If your painting style is really detailed and takes time I can sympathise, to a certain extent, but the value of seeing the artist put the skeleton in first cannot be over emphasised. I usually start by talking through my equipment, choice of colours/brushes/paper etc, as everyone is keen to know an individual artist's working process. This doesn't take too long. I work quite loosely but there's a big difference between loose and slapdash, so I press home the importance of an accurate working drawing, even if it's just a few lines to get proportions right. It's vital I take a little time for this as, if something is out, all the brush skill in the world won't make up for a sloppy under-drawing. The painting is then built up in a series of 2 or 3 washes, beginning with a wet-into-wet foundation wash. Once this is dry I build up the more solid shapes and shadows. I invite the audience to ask questions at any time as 1) it's important to explain something, if it's not clear and 2) it gives me a break from painting for a couple of minutes. It's important to keep talking, even if it means resorting to stories, if you're working on a particularly mundane passage. One of the most important things is timing. I don't expect my result to be a competition winner, as there's a lot to get done especially if tea break over-runs (it always does!). One thing to avoid though is padding out the time, if you do finish early. I bring along a stack of blow-ups of paintings, which I can use to demonstrate specific points. This is never time wasted. If you're new to this, a word of advice... mistakes do happen. Paint runs, paper warps, a wash doesn't go on quite as you'd hoped. Don't worry though. Remember, you're here to teach people about painting and if you're making a few mistakes that they may be familiar with, just go with it. Many's the time I've stopped and turned to the audience and said 'Ok. That bit didn't quite work. Can anyone tell me what I did wrong?' As long as you know what you should've done, you can turn it to your advantage. I have some of my favourite artists demonstrating on DVD. David Curtis, a Yorkshireman, is a master at watercolour painting, especially outdoors. So too is Ross Paterson, an Australian. I haven't had the opportunity to see many live demos unfortunately, but I have seen enough video demos to know what I like and don't like. Probably my favorite ones are from the online Watts Atelier - they're shot well, run at real time, and if something was skipped they mention it at the start of the video (usually an inconsequential thing like staining a canvas,) and things are explained clearly and succinctly. Probably the only downside is the fact when you watch some of the painting demos you're expected to put in multiple hours of time to sit down and watch it, and there does end up being some slow spots here and there. I don't mind this and think it's good to show the whole process for students, especially because there might be an off chance you catch something there that you missed earlier, or a technique that was demonstrated one way earlier but didn't make sense is shown again later and that's when it clicks. All you have to do is just be mindful of the time investment, which isn't a big ask. My biggest dislike is if it's time-lapse that the time-lapse runs too fast, and the whole production feels like it's glossing over major points of process as a result and exists more as a showcase of the artist's ability rather than an educational aid. For shorter demos, say like an hour or two video, I always liked the idea of time-lapse mixed in real time so you can see how particular spots are done while also getting a grasp of how the actual painting comes together. I'd have to say following that, the only other thing that really irks me is if the painting/drawing is shot in the wide for too long - it's generally not an issue, but sometimes the camera is permanently set up at an angle to the art, or it's so zoomed out it's hard to take stock of the minor tweak done to a particular area. But that's the sort of compromise that has to be made if the artist is on their own filming themselves and they don't have the ability to have someone spot the camera and handle it as they go about with the demo. 1. As a musician, you are expected to perform "live" or there is not cash stream. So when I started taking art lessons upon retirement, I guess I didn't have problems expecting hours of practice and performances and I was surprised at the number of artists that don't like doing this. Andrew, in regards to your last paragraph, have you watched the Youtube videos of Jeff Miracola? For me, the best demo videos I've seen give us, the viewer, someone (or the perspective of someone) we can relate to, even if that's done through editing and variation of shots/camera angles. What I love about Jeff's videos is that most are shot by his wife Silvia, and as a result, you get a lot of different views of the work, moving around, some shots of Jeff deep in the work, and many close ups. Silvia even asks questions from time to time. I love it because you get videos shot in the perspective of someone curiously watching the demo. I always go back to Jeff's videos because that personal feeling just sticks with me more. It can get so lost in a tight video that exists only to record a process. Especially when there isn't even narration. I still watch such videos but they stick with me less. Anything will hit home more effectively the more personal it gets. I think James does a good job imbuing his own videos with that feeling as well. I especially love when we see a few shots of Jeanette (and others who've joined them on the excursion) working interspersed! I can't say I've ever learned much from watching time lapses either. And I prefer narration, even if it is just the artist rambling on in an organic way. I like the spontaneity of that. Again, it just feels more relate-able and in turn, sticks with me more. And one final thought from me on videos: I wish more artists would set up a second camera to record their palettes or get it in the shot from time to time! It is one of the biggest things missing from demo videos vs. life demos and it can be sooo helpful because everyone uses their medium in a different way. I feel like more often than not, I've learned more from in person demos watching the artist mix the colors and use their brushes than I do from actually watching the image unfold! A demo (have done many) is but one way of going about things (as I remind observers and that way may be completely different tomorrow even if painting the same subject). After all, is not being an artist about creating? If not creating then you're producing (think production line). And that's a conflict not healthy to art. Plein air painting is but a momentary (human) reaction to that being painted. How could it possibly be the same reaction day in and day out solved the same way (materials and approach) when so many environmental and emotional variables are in play? --Mary Whyte -- watercolor is by its nature exciting to watch because of the element of time, but she does daring things and narrates through them in a calm, confident, practical way. --Joe Zbukvic -- I agree with David Webb, his YouTube videos are excellent, and he talks about the importance of having faith in the process to get you through. --John Seerey Lester -- He shares incredible stories of animal encounters, and lets his wife Suzie take over to talk when he's in the middle of a tough passage. --I agree with Sam about Jeff Miracola and Andrew about Jeff Watts (and his dad) -- their videos are very practical and personable. --Rose Frantzen -- incredible energy and creativity in the way she approaches the challenge of painting a head. I only wish her significant other or friend would take over the Q&A as she works. When I saw her demo, she was trying to deal with off-topic questions that came up from the audience, and I could see it was hard for her to concentrate on such different issues. Sam, I agree, it's so helpful to see the model and the palette. Note: The Portrait Society's annual conference (this April in Washington) is the best place to see a lot of live oil portrait demos. And thanks, Arturo and Colonel for your kind and helpful comments. I am a student myself and I cant really tell you about doing demos, but i watch quite a few of them. I like it when the teachers keep the talking to the essential, some might talk and talk and talk but I do not think it helps. It might get a little boring if one does not talk that much, but it really shows of the painting and focusses on the technique, a little back story is fine but not that it becomes more important than the painting it self. I also enjoy structure in a demo, I once had a teacher who made beautiful painting however the proces was a total mess, first he worked on corners then the middle then the corners again which made it impossible to follow the thought proces. P.S. the second picture does not show. I have done and continue to do so many, from quick gestural and constructive "correcting" on a scratch pad or in the corner of a large piece of paper where the student is working, to all-out full paintings from starting thumbnail to last stages and layers. I, too, am no great fan of being in the fishbowl, but my students know my grunting and mumbling and talking back to the work are part of the internal dialogue I wish they would undertake--- not mere liking or disliking, let alone hating or paroxysms of joy. It ends up partly "how-to" approaches to common problems and procedures, but even more "hey, what about?" experiments and discoveries as the set-up/model reveals itself/him- or herself. One way I recently hit upon to get around that palette-viewing issue, so all students can see how I am mixing, is to paint on a large canvas, in which I then produce the work itself within a smaller rectangle, while mixing the colors at the edges. If I ever want to show them in a gallery, I would have to cut them down and re-stretch them! I must say, working all across the canvas, in patches and swathes, fast gestures and then progressively consolidating colors and forms, à la Cézanne's "petits sensations", while it may make it frustrating for students to follow, is an excellent approach for a unified, Impressionist/Post-Impressionist style. My own preferences run more to watching Old Masterish demos online or in person, like Dominic Cretera or Daniel Greene. 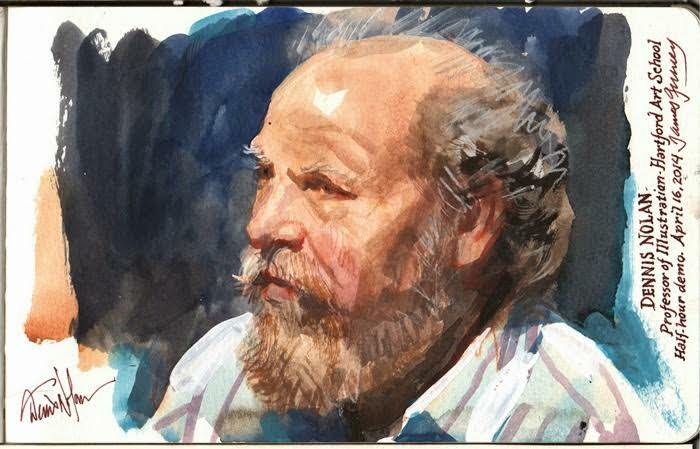 There's a weird and wonderful long video of Jim Dine doing a Life Drawing class, too! These guys (and women, too) have not only skills but wry humor I appreciate. I agree that I do like to have instruction during the demos but I'm okay if the artist doesn't speak for a few minutes while working out an idea or passage in their painting. I try to explain what I'm doing as I do it and I try to provide my thought process as well when I'm doing a demo. I usually share it when I mess up so the students realize that making mistakes and struggling are both part of creating art. I like to see the model, the canvas & the palette. Most only show the canvas, so I have no idea what the model looks like. Rose Frantzen's live demos are great as you get to see all three! Demoes don't need to be too rushed. I'd much rather see a partially completed painting/drawing that is well done, than a finished painting that has been hastily made for the sake of completion. In live demoes I don't mind quiet periods where the artist is fully focused on the art instead of talking all the time. I appreciate a demo that has a sketch already laid out so time is saved, but the artist will still explain how and why they handled the sketch the way they did. Quiet demos are worrisome-- the reason the students are watching is because we're interested in the process but we have no idea what is going on in the artist's head as they're working. They must articulate their actions--they should never assume everyone is a painting pro just because they are. Some demos I have seen either in art school or illuxcon resulted in a great painter who didn't explain what they were doing. They did a beautiful painting in the time they were demoing... but they zoned out and just forgot people were in the room with them. Also sometimes you got a painter who feels THEIR way is the only way or the TRUE right way. I like when the person teaching the demo has a specific goal in mind of what they'd like their students to learn from the demo and know that when the demo ends they should be able to apply the methods themselves. If they run into any challenges along the way, explain how they solve the problem because that's all opportunities for more knowledge. This also helps to give the teacher an idea of what to explain during the process, and let's the students know what to look for and take notes on if necessary. To me, this is the difference between simply watching someone else painting something incredible, and actually be able to apply those skills to your own work. Also, be open for questions while the demo is happening so you can walk people through it as they happen, but try to keep the lesson focused and on track so the discussion doesn't go too far off topic and take away from the demo. Thanks James! The dreaded silent demo. Talk through your choices. Tell us what your doing and why. I agree with all of the above. Watched one last night where the canvas was tilted away from me slightly and only registered in 1/5 of the screen. I watch on my android a lot and even thought it's a note and large, I was still frustrated. Luckily the artist had a blog with close ups but I was still annoyed for a half hour before realizing that. Worse than the silent demo is the "when are you going to actually draw/paint" demo. Blah blah interesting blah. Knowledge is its own reward. But seriously this isn't radio. I am visually oriented. Give me something to look at. Which is why I love your videos. Just enough blah blah combined with ohhh pretty, and some cut aways to explain the materials. Keeps my squirrelly attention where it should be. Hey GJ-family. In a (sort of) related note, I'm planning on going to the National Portrait Conference in 2 weeks in DC. If you're also planning on going and would be interested in having a sketching meet-up shoot me an email jared.cullum@gmail.com or text me 804 615 6146 and maybe we can get a group together to sketch. Just thought I'd throw it out there and see if there's any interest. Will probably comment closer to to remind people! Have you all seen that Australian program, "Put some color in your life." There's some really nice demos on there. It's on youtube and each episode is basically a demo. There's a really good couple of Alvaro Castagnet and Joseph Zbukvic episodes. I have done demos and been particularly bad at talking (or atleast I say uhhhhhhh, a lot) and painting at the same time but I'm working on it. It's something I need to work on. I love when the artist can talk through it. I love to hear all the nerdy details about what they're using and why. It's always nice when the person seems excited or passionate about it. What a great article and links! I love the t shirt idea, but mostly I just mumble or wear headphones at complicated bits. I can paint well on location and just escape into my own little world but I've always had more problems teaching an audience. Answering questions while painting does make it so much harder to paint well. I can do it, but not my very best work and it's exhausting. YouTube or videos are much easier since I can dub in if I forget to talk when I'm concentrating. I am so glad other artists feel the same. Thank you so much for this article! I've done many live demos. I've never really wanted to do this sort of high-stakes painting but at some level, I realize it's a growth experience and part of the job of teaching painting, which is visual language. The key is an incredible amount of preparation and working out the subject and palette in advance. That way, I can relax and speak through the process. I combat nervousness by reminding myself that painting is what I love to do and if I focus on the joy of it, then my enthusiasm for the process takes over. Nice likeness of Dennis! I know him from our life drawing group, and I recognized him instantly without reading the label. I think I could write a book on doing demos having filmed and produced over 100 PBS television episodes of "Painting and Travel with Roger and Sarah Bansemer" but I think there are a lot of good comments already posted. 1. Since the programs are on TV I use at least 4 cameras to film with so the viewer doesn't get stuck with one angle or view and I show the subject frequently. 2. I paint to the side so I don't block the viewer from my own painting. 3. I keep it moving. Sometimes I make mistakes but viewers seem to appreciate a mistake, admitting it and then correcting it. It gives them the permission to make mistakes too. Painting is difficult and I try not make it seem like it's not but to be persistent as possible with their own work. The demos that are shown that always come out "perfect" are usually about a technique and not really about the making of art. 4. I never use the word "you" when I doing a demo especially on TV. Being non judgemental is important, so I never use the "You should" phrase. 5. I keep in mind that demo is as much about entertainment as it is educational.If it's not entertaining and fun to watch then the educational portion will fail. 6. I concentrate of building the foundation of paintings rather than the details. Most viewers love the details more than anything but without a good foundation and solid start the painting will always fail so I stress that. 7. I try and stress that painting is more about seeing and observing than it is about the actual painting so I continuously talk about what I'm seeing in the subject that is making me paint it that way I am. Those are just a few things I try and do... Mostly I enjoy sharing the things I have learned. Thanks, everybody. And Roger, you've been doing a popular "Paint Along" demo, right? Great idea, and it changes the game for the student if they can attempt what you're doing at each step. "It's the human condition that our innate desire to be admired becomes a major obstacle in our efforts to be useful and helpful to others. Masterful displays of ability meant to be impress can easily be off-putting; moments of incompetence, like watching a baby begin to toddle, can be so endearing." Thanks, Matthew Mattin! I've drawn Dennis about four or five times, Getting a little closer each time. Mary, good tip on combating nervousness. Not only are we doing what we love, but we're among friends who like the same things. Jennifer, I find it so much easier to add the commentary on a video voiceover. Also helps avoid repetition. Jared, great that you'll be at the portrait conference. Don't know if we need to do a formal meetup. Everyone is super approachable. We'll be sketching the presenters from the side of the stage. Join us up there. Strength in numbers! I do many demos for my workshops. I probably do a hundred or more demos a year. Fortunately, I'm pretty good at keeping both left- and right-brain humming along as I work. I even let students ask me questions as I work. I have only one request: questions asked must be on-topic. If you ask me what color I'm using, I can (usually) let you know; but if you ask me where I was born, how long I've been painting, etc., these questions throw me right into the ditch. So, I usually start my demos with the request that only relevant questions be asked. Sometimes, though, I'm still at the planning part of a painting when the questions come out, and I may have a delay in answering. It's almost like the signal has to to the moon and back. (Apollo-era adults will remember the 3-second delay!) This can also throw me off my game a bit. I know at least one well-known artist who requires that NO questions be asked during a demo, and that the questions be saved until the end. He advised me to do the same. I may start doing that. Michael, good point, and I totally agree. I was once asked while doing a head drawing demo about what challenges I faced while dealing with publishers' contracts, and I just laughed and said, "That's a good question, but please let me deal with it after I finish this demo." Same with the questions about career and money that come up when I'm plein-air painting. Another new hybrid form of live demo is the Periscope or Concert Window demo, where huge numbers of questions arrive by text. For that, having a spouse or friend reading the questions and answering the easy or off-topic ones can be a life saver. Eternal student here. I have had the good fortune to see a whole lot of demos, from your own wonderful workshops to weekly figure drawing instruction and pleine air outings. My favorite demos have been ones where the instructor talks about what they are thinking while doing it, followed by those where they discuss the technique they are about to demonstrate before executing it. Glen Orbik was pretty amazing at a combo of the above two methods, and he had a good patter to go along with the schtick. He and the other members of the Fred Fixler/Frank Reilly school of art instruction seem to universally try for that combo. It's the approach that has worked best for me as a student. The flip side would be the silent demo, it always feels a bit uncomfortable, and at those times I feel like as a student my job is to try to pull more information out through relevant questions. Your demos were great, you had a patter going and took questions throughout. Fantastic thread here too! Many new (to me) artists to check out, thank you! You have hit the nail on the head. I discovered that people much more prefer to watch a demo where the artist finds issues, provides a narrative on how they will fix it, then shows how it is fixed, then continues to progress through the demo piece with this method. I came across this myself where I was rushed before one certain demo and not fully prepared so I had to paint something I never had before. Needless to say I fumbled and struggled and made mistakes throughout but brought the piece to completion in the end; as much as can be completed in two hours. I thought I had bombed as I wasn't fully prepared for that particular demo and struggled to pull it together throughout. When it was over people came up and told me it was the best demo they have watched as they got to see the mistakes and my process of reasoning for fixing what the issues were. It gave them a base so they could tackle the same problems. This opened my eyes and has not only changed how I demo but also how I paint. In a way it was as much a benefit to me as it was to those watching. In a live demo, sometimes questions are dismissed as not important, that could be critical for the asker and perhaps the whole audience. It's true that sometimes questions are irrelevant, but it's also true that a group may be missing a bit of helpful knowledge. I suppose if a group really doesn't need to know something, explain why the answer doesn't make a difference - but also be prepared to share information outside of the presenter's goals. Ted Gordon, good point. If the problem is that the question is off-topic, like "What were the key moments of challenge in your career?" Or "what are the pros and cons of having an agent?" then you can say, "Wow, good question, would you please remind me to answer that when I finish this demo? I want to give it my full attention." I have had the pleasure of watching Daniel Greene and Ray Kinstler demonstrate painting the portrait head at least three times each. Both are very effective, but couldn't be more different. Dan delivered essentially the same information each time, in the same order, (complete with the same joke at the same point!). He carefully covers materials, his complex palette, his order of work, AND delivers a substantialy complete head at the end of the three hours. A model of logical presentation and method. Ray is a story teller. He briefly covers his simple palette lay-out, explains his toned canvas and starts in. The development on the canvas seems largely intuitive, notes on what he is thinking about the painting in hand are randomly mixed with philosphical musings and stories about commission experiences and tales of masters, Sargent in particular. Lot's of jokes, especially if the sitter enjoys conversation as well. The portrait never got past being an inspired block in. I would happily watch either of them do it again! I thought your demo I watched at Art Institute of Boston (At Lesley) was one of the most professional and enjoyable presentations, but not to the point of being rigid. Your personality was there and I feel like that's the most important part; being with an artist in their natural creative atmosphere (Whether it be quirky or not), it informs the viewer to the entire process, state of mind and accompanies all the technical aspects of art. I like hearing what's going through the mind of the demo-er as well, which if I remember you were stating along with answering questions. I actually think you should give lessons on how to demo cause some are very bland and not helpful at all. I hope I get to meet you again! Ron Lemen does a great job making his demos less of a show and more of a lesson. He pauses and looks over his shoulder to make sure what he is saying is making sense to folks. These pauses serve to welcome questions and discussion too. It's the human condition that our innate desire to be admired becomes a major obstacle in our efforts to be useful and helpful to others. Masterful displays of ability meant to be impress can easily be off-putting; moments of incompetence, like watching a baby begin to toddle, can be so endearing. I've done tons of demos in my drawing classes at RISD, not quite the same thing as doing a long demo of a painting from beginning to end, but I think fundamentally it's very similar. When I do a drawing demo for my students, it really is a completely different beast than when I'm in the studio drawing by myself. I think for me the biggest difference is that during a drawing demo, I focus the vast majority of my attention on what I'm saying as I draw, as opposed to being concerned about my drawing process. For me, I have to be able to trust that my drawing skills are strong enough that I can invest more energy into my words and speaking. While of course what you're drawing and your physical movements are critical in the demo, if you're not articulate, concrete, and specific in what you say, the demo is not going to be very effective. I've done thousands of demos at this point, so I usually an confident enough at this point that I won't drawing something that's embarrassing! Clara, thanks for the comment. I'll bet your demos are really helpful to watch. I think you're right that it's most important to put the thought into the talk.